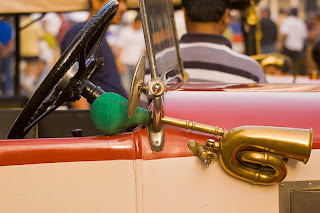 The streets have been filled with a deafening symphony of car honking the past couple of days. Awfully annoying as it is, there is really little else one can do except shut oneself off or stuff one's ears with cotton balls hoping for the honky tonk cacophony to stop. When the earsplitting raucous starts, there can only be one conclusion, and no, it is not a bad day of traffic due to some lousy traffic light breaking down, but rather, football season. Yes, the all hated football season, no offence intended to the soccer fans out there. Football season here takes the extreme end of the spectrum. Mark my words, it is only one end of the spectrum more often than not. It is the cause of rambunctious activity in every corner of the neighbourhood and city with all the alcohol, adrenaline and testosterone on the loose. In the worst of cases, it is all hell break loose. Hell, even my housemommy told me to stay in, just in case. In milder cases, it is just screaming tyres on the streets, neverending car honking, and your neighbours either cursing and swearing for all their lungs are worth, or attempting to smash the walls down to extend my living room space whilst happily boinking away like horny jackrabbits, or what it sounds to be like, the whole bloody day. It is impossible to even use the damn bathroom without hearing the neighbours on the other side, inconceivably possibly doing the very same thing. Honestly, if the neighbours worked any harder at it, fitting in a jacuzzi hot tub into my bathroom just might become a very real possibility. Damn the stupid walls for not being soundproof. As am typing this, am hearing a couple of thuds just behind me. Thank god it is not a continuous sonorous thumping like a jackhammer on a construction site. And no, do not think the neighbours are that interested, let alone enthusiastic in moving the furniture at two o'clock in the morning. So whilst my poor ears are subjected to pure torture of such offensive decibels and are working on cultivating a newfound friendship with them cottonballs, there is really little that can be done till football season is over. Reminds me, got to check the telly guide for that auspicious date and probably light fireworks, if possible, to celebrate its glorious end. The aim of the day, hear no evil. I typed out a whole message but promptly lost it. how smart. I watched the match last night, Cro won, I know you must be going crazy with the noise and all. Billy has some good earplugs they use in the army, I think I should really get some to you. Don't think earmuffs are gonna work that well. So tell me your address! Mail me or something. Mothers are ... their instinct is to feed people with food, and I'm glad you're well fed. Face may have acne, but you are still a gorgeous person. We'll def catch up when you get back :) but this time, let me know in advance so that no phone networks are gonna cut short us spending time tog!